A true friend plays well with others and brings you cheer when you need it most – that would be a good description of a garden Hellebore. Early blooming and thriving in the shade of trees or deciduous shrubs, Hellebore plants are a fine addition to many tricky garden spaces. Naturally occurring species and breeding programs have provided Hellebores in a range of pinks and purples. 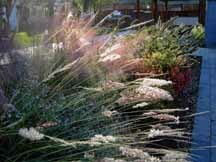 The plants thrive in the shady spots of the garden, especially under winter-dormant shrubs and trees. Hellebores can make lovely cut flowers but the typical nodding form is enjoyed best if placed on a shelf or mantle and seen from below. A favorite way to compensate for the down-turned blossoms is to float them in a shallow bowl, the same way you might enjoy a Camellia. Recent breeding efforts have created varieties that have more upright facing blossoms. The details of Hellebores can really be appreciated upon close inspection. What we think of as the petals are really a colorful form of sepals and the actual petals are sometimes fused together to form nectaries, in a small ring around the central anthers — just visible here in the green flower on the left. The best Hellebore for low water areas is the bright green Corsican Hellebore (Helleborus argutifolius). It is much larger than than it’s colorful, diminutive cousins, but it thrives all year in dry shade beneath the canopy of Coast Live Oak in California. The coarse but beautiful foliage of the Corsican Hellebore makes an interesting statement all its own. It persists all year compared to some of the smaller species that can go dormant. The smaller Hellebores have stem-less leaves that emerge straight from the soil and benefit from pruning the older foliage in December. Double sepaled varieties are also popular. Hellebore shades from barely blush to deepest Claret have recently been joined by a pale creamy yellow variety just becoming available to gardeners as well. The genus Hellebore is native to Europe and Western Asia. Species are found from Majorca, Sardinia, Greece, Turkey and the Caucasus. Some species are known by their common names; Christmas Rose and Lenten Rose. Traditionally this indicated when they bloomed, but the bloom time in most gardens is over an even longer period. The biggest charm, in addition to their particular beauty, is their early appearance and ability to combine with later blooming plants. They will often set viable seed, gently spreading where they are happiest, in the shade of taller companions, waiting for their time to shine.